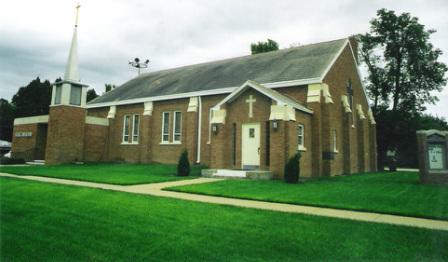 Peace Lutheran Church has been a part of the Hastings community since the middle of the last century. 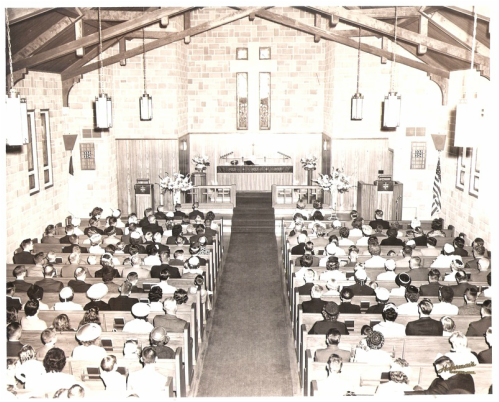 Looking back over the years of her existence, much has changed: the congregation has been served by 5 faithful pastors in several worship spaces; the color of the hymnals in her pews have gone from red to blue to maroon; the faces of her members have changed as numbers have grown, friends have moved away, and the faithful have been laid to rest, awaiting the resurrection of all flesh. In addition, the community of Hastings has seen its own degree of change. Businesses have come and gone, landmarks and demographics have altered, and where and how people live would be almost unrecognizable to those who lived and worked in 1940s Hastings. and salvation won by the death and resurrection of the Son of God; and where the traditions handed down from the Church continued to be held in honor. As we continue into the 21st century, we don't know exactly what roads lie ahead, but we trust in God's promise as things continue to change around us, that no matter the location where we gather, no matter how many or few we may become, and no matter the language spoken and sung, He will continue to feed and sustain His people. 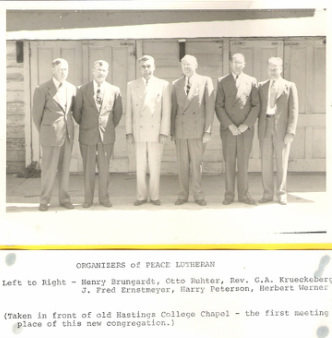 Peace Lutheran Church of Hastings, Nebraska came into existence early in the year 1948. 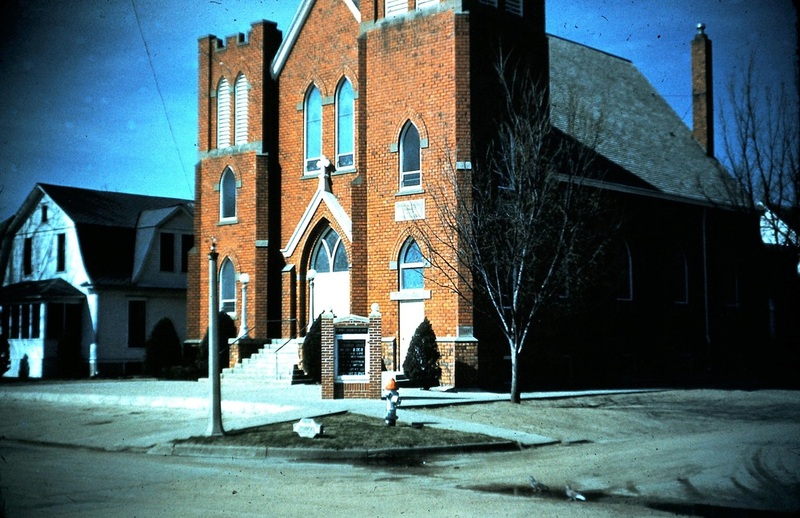 Some of the first meetings during the earliest organizational period were held in the Zion Lutheran Church basement on South Denver Avenue in Hastings. The Southern Nebraska District Mission Board called Reverend G. A. Krueckeberg who was to establish a new congregation in north Hastings. On March 7th, seventeen people met in the Little Theater in McCormick Hall at Hastings College to hold their first worship service. 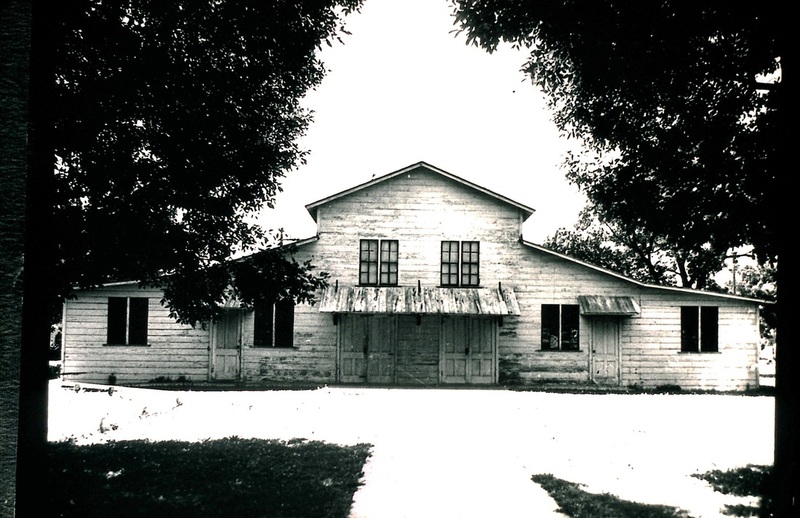 In December of that year, the site of worship was moved to the old chapel building, which later burned down. Voters chose “Peace” as the name of the new Mission Church on June 22, and on July 14 they passed a resolution to organize as Peace Lutheran Church and to join the Lutheran Church--Missouri Synod. 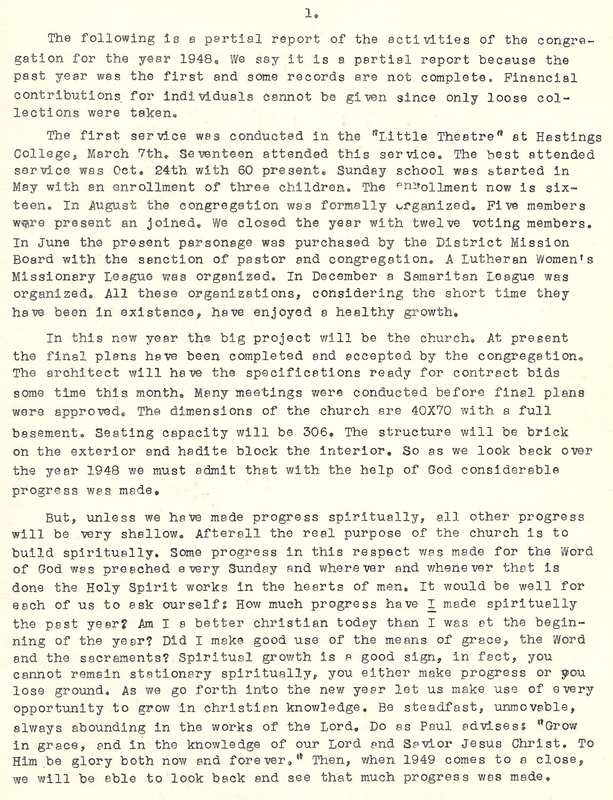 The construction of the new church building was finished in 1950. The building was forty by seventy feet and seated 300 people. The total cost including lots, fixtures, and subcontracts was about $48,000. Dedication Day services were held on February 19th. 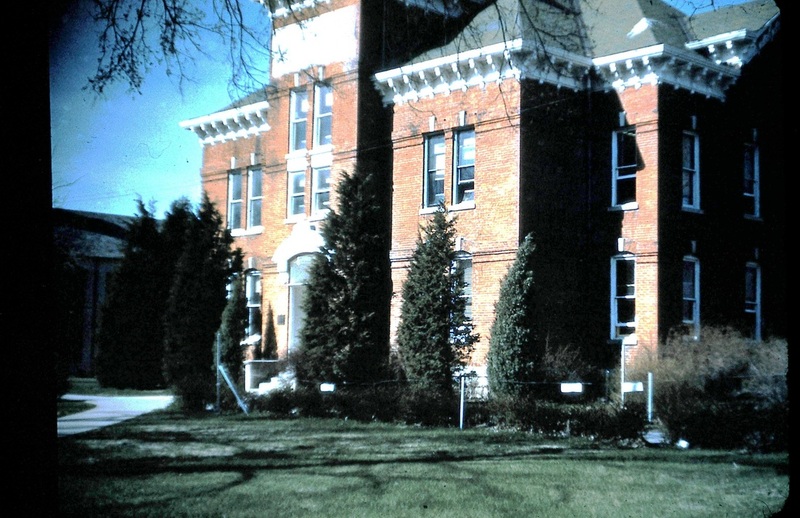 In 1969, Peace began the con­struction of an educational unit, enlarged narthex, northern addition, lower storage room, and a tower with an aluminum spire and gilded cross. Ground-break­ing ceremonies were held on June 15, 1969. 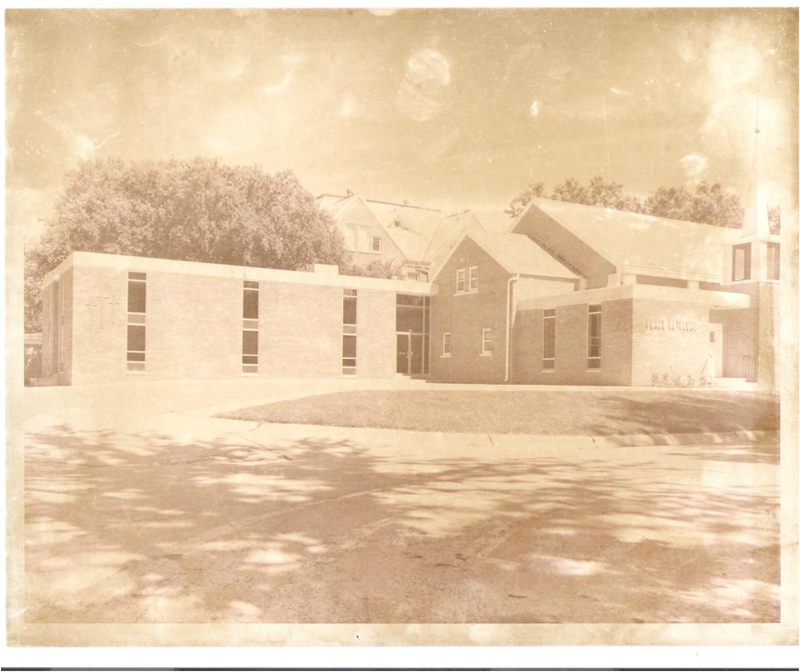 A year later, on June 28, 1970, the new addition was dedicated. The entire project was built at a cost of $98,500, including furnishings. In 2014, Peace set out new capitol campaign, "Opening the Doors at Peace", to build a new Fellowship Hall, narthex, kitchen, elevator, drive-up, parking lot, and restrooms to better accommodate the congregation and to improve the accessibility. Ground broke on April 3rd, 2016 with the addition dedicated on October 8th, 2017.